A clean and welcoming environment is essential for the success of any business, so with around 80% of dirt entering your building on the soles of people’s shoes, an effective, efficient and attractive entrance matting system is more than just a good first step – it’s a necessity. To this end, at Jaymart, backed by over 40 years of experience and the world’s largest collection of specialist mats and matting, we have developed a 4 stage entrance matting system designed to not only keep your premises looking their very best, but that is itself, easy to clean and low maintenance. The system can be tailored to your specific needs, taking into account the external environment, the type and volume of foot traffic your premises experience, and even which direction your door faces; and as ever with Jaymart, there are plenty of materials, styles and colours to choose from. STEP 1: The best way to keep your premises clean is to stop dirt from even getting through the front door. Effective exterior matting scrapes clean and wipes dry, leaving the worst dirt and grit outside, and allowing subsequent interior matting to clean even better. 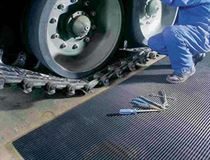 STEP 2: Working in a similar way to exterior matting, this is similarly tough and durable matting that carries on the work to remove the last of the most damaging soil and grit, and continue the drying process. STEP 3: With the worst of the damp and debris now dealt with, secondary internal matting is a high-specification, high-performance product that finishes the dusting and drying. STEP 4: The foyer is one of the highest traffic areas in your building so, however effective your entrance matting, easy to clean, highly durable and attractive carpet that always looks its best will help you make a great first impression – every time.